Founding member of Watermark Wealth Strategies, LLC, Kyle has over fifteen years of experience in the financial industry. He specializes in developing tax efficient retirement and estate for high net worth individuals. Kyle prides himself on the longterm relationships that he fosters with his clients. By creating a foundation based on understanding of each person’s unique needs and objectives, Kyle can help his clients visualize their goals. Supported by this culture, Kyle works with integrity, objectivity, and experience to help clients and families achieve financial security. Along with numerous service awards recognizing his dedication to the needs of his clients and practice, the experience and knowledge Kyle has worked for has also been recognized by multiple appearances on CNBC’s Squawk on the Street and broadcasts on Bloomberg radio. Outside of the office, Kyle loves spending time with his wife, Amy, and his son and daughter, Brady and Kylee. He loves coaching Brady’s little league team and supporting Kylee’s soccer endeavors. 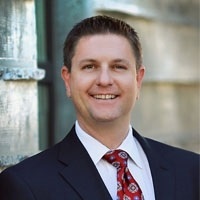 Kyle Richardson – Founding Partner, CFP® - Series 7 (General Securities), 24 (General Securities Principal), 63 (Uniform Securities Agent State Law), 66 (Uniform Combined State Law) registrations and Life and Health Insurance.